Are the New Rules for School Lunches Enough? The first big change to school lunch nutrition standards was released last week. The goal is to provide healthier lunches for children at school, a major meal for many school age children. The change means more fruits and vegetables in school lunches, and smaller portion sizes. But are these changes enough? There’s a lot good to be said for the changes. Schools can get six more cents per meal, which doesn’t sound like much, but it’s the first real increase in 30 years, and is tied to the school’s performance in providing better meals. Training and assistance is available to help schools comply. There is a focus on limiting saturated fats, trans fats and sodium. More whole grains are to be served. The news on school lunches isn’t entirely good. It rarely is when you’re talking about something that goes through so political a process. Tomato sauce on pizza still allows it to be counted as a vegetable, and there aren’t limits on how often potatoes can be served. On the plus side, baked or roasted potato servings will be encouraged, rather than french fries. I’m sure this will have more impact at some schools than others. My kids’ school, for example, already has a salad and fruit bar option for the kids daily, and they go for local produce when possible. It’s a pretty nice deal, and something I’d love to see more schools offer. The only problem is that you get that or the hot lunch, and the hot lunch is more of a typical school lunch most days. On the plus side, pizza days include the salad bar with the pizza, so that one is popular and probably balances out better than many other school lunches… depending on the kid picking the lunch, of course. As a parent, I think they key here is to make sure that your school makes the most of these new standards. 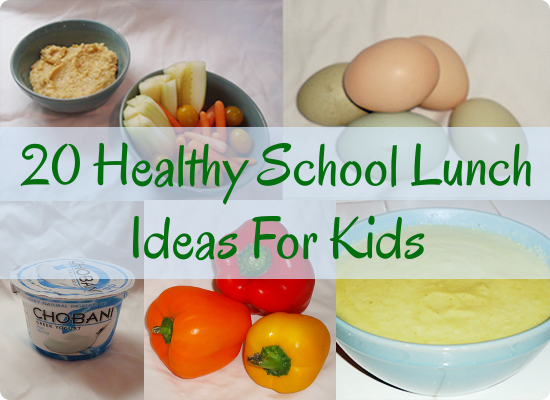 If your school isn’t offering sufficiently healthy lunches, speak up and encourage change. There’s still a ways to go, both in making school lunches healthier and in teaching kids to eat better. The schools can’t do it alone. We parents have to do our part to encourage children to eat healthier foods and to be more active. It will take time and effort to get it right. Many parents these days are concerned with the quality of lunches provided by public schools. To put it mildly, many schools offer extremely unhealthy foods for lunch. As parents who want their kids to eat better, how can you help them? Packing a healthy lunch for your child is one of the simplest things you can do to help them eat better. The challenge is making a lunch they’re more likely to eat than to trade away to friends. The first thing to do is know what your child likes to eat. This may change from year to year and even in the middle of the school year. Keep talking to your kids about what they like to eat for lunch and find healthy ways to provide that. School lunch packing is not the best time to experiment or challenge your child’s food preferences. It’s easy for them to trade away unliked foods, or even to just throw it away uneaten. Push their interests at home where you can see the results. Sometimes leftovers are great for lunches. You may need to provide a thermos to keep the food warm, but other leftovers taste great cold. If there’s a meal your kids really love, make extras that you can separate into easy lunches and freeze. You can save excess for dinners for the whole family as well, of course. Providing them with favorite home cooked meals to eat at school may increase the chances that your child will eat what you’ve given them. Don’t stick to the traditional sandwiches for every meal. Wraps are a great alternative, so long as you pick healthy whole grain tortillas, not just white flour tortillas. Wraps are easy to make. You want to cover most of the tortilla, but leave a little distance from the edges to keep things neat. Lunch meats, vegetables and spreads work well. Mix them up and find out which your kids love the most. Do let your kids try hummus sometime, first at home, but if they like it, hummus is a great wrap ingredient. Know what your kids love in terms of fruits and vegetables. Most will have a few favorites. Try to provide these in their school lunches. My kids love bell peppers and cucumbers, for example. Put these in their lunch and they’ll usually be eaten. Kids don’t need a feast at lunchtime. They need simple, filling foods and not a big selection. They’re usually as interested in chatting with their friends as they are in eating their food. Sometimes more interested in chatting with their friends. Give them too many choices and a lot of it will end up in the trash. Kids love getting a dessert item in their lunches. An occasional cookie or other treat isn’t going to ruin them either. But the dessert doesn’t have to be cookies or candy. Berries work great. Granola bars usually have a lot of sugar, but have other healthy ingredients. Try to balance sweetness with good for your kids. Don’t feel bad if you’re packing the same lunch over and over. Most kids like consistency. If they complain, that’s the time to mix things up.